Of course cows, pigs, and chickens belong on farms, and nobody looks askance at a farm full of llamas or buffalos. But there are some farm animals you might not expect. And when I say "not expect," I mean holy crap WTF - why are these animals being farmed? Spider goat illustration via The Stranger. Everybody loves a bear, especially when they are covered in a light dusting of snow. But you still shouldn't hug them, and it would seem like you wouldn't want to farm them either. In traditional Chinese medicine, however, bear bile plays an important role - and to get that bile, you need farms full of bears, much like this little guy (pictured in his small cage). For several years now, the Chinese scientific and medical communities have called on citizens to put an end to the cruel practices in bear farms. They argue that there are many alternatives to bear bile, including herbal remedies and synthetic bear bile made in labs. Silk is made from the cocoons of mulberry silkworms. A small number of moths are raised in large "farms" (this video was taken by a tourist who visited one), where they lay thousands of eggs. When the caterpillars emerge, they eat leaves for about two months, and then spin their unique silk into a cocoon. Ordinarily, a moth would emerge from the cocoon, but farmers typically heat the cocoons until the metamorphosizing creatures inside are dead. Then they boil and treat the silken strands, weaving them into the shiny, super-strong material we know as silk. It's easy to have a whole farm in a plastic trash can if you're a worm farmer. Worms are terrific breaking down compost and adding nutrients to soil. Plus, they're a favorite food of birds and fish, so it's no wonder that worm farms everywhere sell them by the bucketful to other, more traditional farmers. For anybody who owns reptiles, who are famous for snacking on crickets, a cricket farm is a must. Armstrong's Cricket Farm even offers a product called "Cricket Cafe," which ships with a generous amount of live crickets, both young and mature - use the older ones now and save the younger ones for a meal later on! In many parts of the world, including Mexico, people eat crickets too - they make a nice, crispy snack. In this video, you can see a fascinating scene at the Kentucky Reptile Zoo, in which vipers are "milked" for venom that will be used in medical research. Though there are few official snake farms, many facilities that keep snakes regularly milk them for their venom, thus making them oddly equivalent to farm animals. "Biological control" is a form of pest control where you use insects to combat other insects so that you live a life without annoying bugs swarming everywhere. There are many kinds of pest control, and they all require bug farms to grow and rear bugs that eat bugs - such as the tiny wasps that Biocontrol Network sells to combat fly infestations. Just stick these tiny fly parasites in areas where you think fly eggs are incubating, and they'll destroy the fly larvae by planting their eggs on top of them. The wasps are not pests, and kill your flies before they start. OK fine, yeast isn't an animal. But it isn't a plant either, so there. It's a fungus, and fungi are scientifically classified as being in their own kingdom, separate from animals, plants and bacteria. It's also one of the most important ingredients in one of the most important beverages in history: Beer. All over the world there are yeast farms both large and small devoted to providing brewers with the ultimate tiny machines of frothy fermentation. Many experimental farm facilities grow chickens so they can use their eggs to incubate viruses. Instead of omelettes or chickens, these eggs hatch into flu viruses that are used by medical researchers to develop vaccines. Several parts of tigers, including their bones and blood, are popular products in China. That's why the country has over a dozen registered tiger farms, where the big cats are bred in conditions that range from pretty nice to truly awful. Conservationists are divided on what to do about these farms, which some consider a (relatively) humane alternative to poaching. Others consider them completely unacceptable. But for now, they continue to be legal, and the tigers there are grown to be exhibited, slaughtered, and sold. 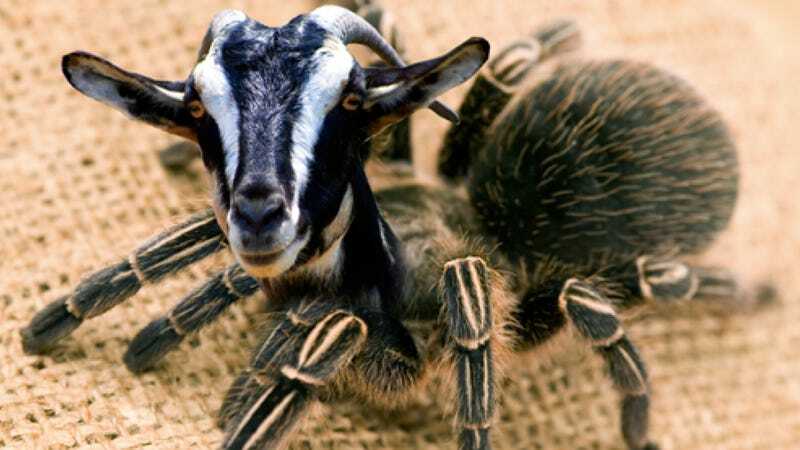 For at least a decade, synthetic biologists all over the world have been genetically engineering goats who are part-spider. Specifically, the goat's genes that aid in creating milk have been modified to produce spider silk proteins too. Spider silk, which is incredibly strong, can be used in many products, including body armor. Thanks to the folks at Science Online, including Christopher Mims, Emily Anthes, Tiffany Trent and Michelle Sipics, who gave me ideas for this story!